One could consider that Joel Sokolov has a life-energy aesthetic. We can see this in his leaf- and tendrillike burgeoning, reaching, twining forms, winging out into space from a central core. These movements are a plant energy, but also the energy of the body and spirit of the creating artist. For 25 years Sokolov lived in New York’s Tribeca overlooking the World Trade Center until it was gone in the 2001 disaster. In 2004 he moved to Hawaii to live near the sea in Puna, in the far eastern district of the Big Island. His new vistas of tropical foliage on the edge of a vast lava field with far sea horizon took him from the ethereal reach of his previous work and plunged him into the specifics of the nearby entangled greenery. 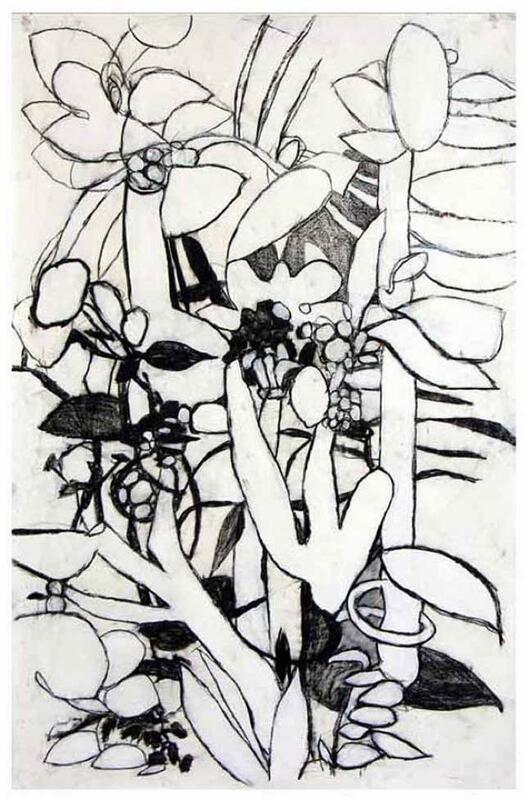 He began to delineate the patterning of turgid stalks and leaves, the clustering of petals and the twining of tendrils (as in Puna Foliage #3, 2005). Never quite fully realist, never fully abstract, these drawings yielded a transformative vocabulary. Triggered by the artist’s close-up experiences of plant clusters, the drawings of 2006 present a responsive cycle to the subtle Hawaiian seasons. Images burst forth as abstracted orchestrations of pattern, rhythm and swinging lines—softer and more dense in the spring (Puna Spring #5), ecstatically entangled in the summer (Summer #1), and spreading, darkening (Fall #8) and sometimes unraveling (Fall #2) in the fall. There is even a surprising skeletal spiraling of granular white swirls on a spotted gray ground (Fall #7). None lose their vital intensity. It is as if all of his forms are infused with what the philosopher Henri Bergson called an élan vital, a vital force that impels all living organisms, even evolution itself. In these drawings Sokolov explored the possibilities of spontaneously stacking, layering, connecting and reversing his vegetal forms, especially taking account of the reversals of figure and ground, of light and dark. We see such reversals in Puna Fall #8, 2006, where leaf shapes become black, interspaces are white, and patterns of both play on a gray ground. The shapes of spaces become as important as those of objects. “Life” qualities are mirrored and reverberate in all parts of the image. Sometimes pure energy lines burst out from a center (as in Puna Foliage #8, 2005). And always, the mode of rendering with markers, acrylic, crayons, pastels and graphite on paper (or on gessoed paper) creates a tangible surface and juicy tonal textures that effect substantive presence. The resulting large-sized formats (around 40” x 26” and greater) immerse us in the phenomena, creating a full-bodied presence, rather than just a mind experience. In Puna Spring #4, 2006, the undulating edges, rib forms, stamens and tendrils take on a life of their own. 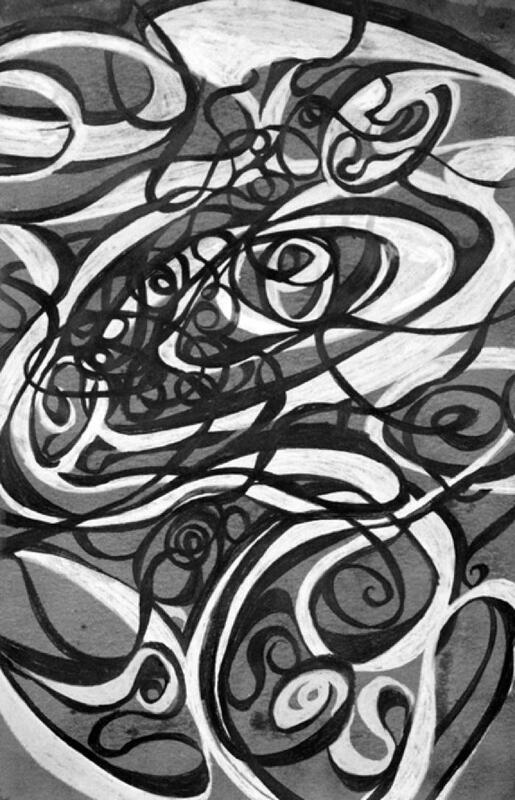 They swirl and dance as radiant white or pitch black, tensile contour lines on an atmospheric black ground. Paul Klee proposed that black is the primeval color. One can experience this in Sokolov’s suggestive, dark infinite expanses that extend beyond the picture format. The ecstatic lines rhythmically alternate thick and thin, expanding and contracting, seemingly pulsating with what the Chinese call qi shi (“breath-force” or “breath-movement”), resulting from the breath movement of his creative process. The linear elements reach, twirl, touch and spin through each other and around themselves. As important as this ecstatic dance are the spaces within which this all occurs. Annie Dillard writes about the spaces of a landscape, that the “gaps are the spirit’s own home…so dazzlingly spare and clean that the spirit can discover itself…. The gaps are the clefts in the rock….They are the fissures between mountains and cells the wind blows through.” So it seems here. 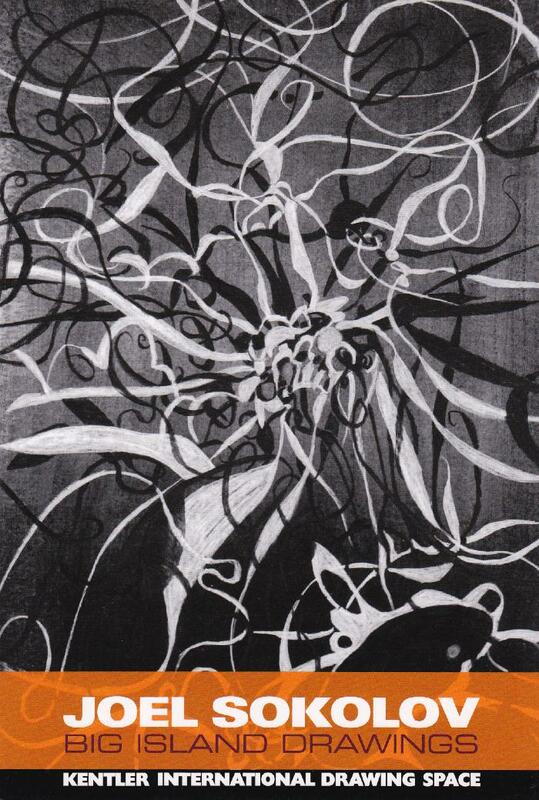 In the more recent works of 2007 and 2008, the tendrils gain an independent life as abstract ribbons of pure energy (10 2007 #7, 2007). These ribbon forms coil vertiginously into space around each other and around themselves, creating a dense overlay of teeming activity. As they curl in, they form womblike spaces; as they spiral out, they move into new encounters and configurations. They can stretch anthropomorphically from bottom to top (4 2007 #1, 2007), swirl across and deeply within a horizontal expanse (10 2007 #3, 2007) or sweep through the space as the entangled patterns of the undulating force of Wind (2007). Some are simply labeled “forces,” as in Forces #4 (2007), where broad, curved bands, extending beyond the picture edge, vaguely suggest spiraling outer-space structures. The spiral itself is ubiquitously present in nature, whether it as the spiral growth of a pollen grain to inseminate the flower, or the formation of a snail’s shell, the coiled snake, the path of a whirlpool or whirlwind or even the spiral movement of a galaxy in formation. In art the spiral is a universal symbol of generation, growth and force as it also emerges in Sokolov. / In Sokolov’s drawings, the swinging forms take on not only the energy of nature but also of the artist himself. As he explains it, he follows his body and his hand rather than planning ahead. The forms seem impelled by rhythms of his inner emotional resonances. They graph the artist’s own presence and creative engagement. This is reminiscent of the abstract expressionism of Jackson Pollock in the mid 1940s (e.g., There Were Seven in Eight, c. 1945). Whereas Pollock enacts an engagement of fury with his slashing brush and frenetic, frayed, far-flung lines, Sokolov, by contrast, sets down pulsing lines that are a celebration of creative life energy. In 2008 Sokolov’s lines morph into varied energetic, abstract “personalities”—thick, thin, scallop shaped, oscillating. These types of rhythmic lines engage each other in complex interwoven dances. Each scenario can be experienced by following one line and then another through their collective adventures. Each has different ecstatic rhythms and clustering in space. Each enacts the life energies of nature as much as they do those of the artist. This resonance of the artist’s self and nature’s force is truly at the heart of all of Joel Sokolov’s work.